Yesterday, I did it. I finally arrived in Santiago. And though the last 5kms felt like the longest I’d walked (and possibly were more than 5kms as I lost the Camino once or twice) the moment I spotted one of the cathedral’s spires I was flooded with relief and happiness. Exhausted and elated, I walked into the square in front of the Cathedral. My eyes were filled with tears and other pilgrims greeted me and hugged me. It was truly a wonderful moment. Last night I checked into a hotel and today I feel slightly at a loss. I don’t have to get up early. I don’t have to pack up all of my things. I don’t even have to wear walking boots (I bought a new dress and some heels yesterday). 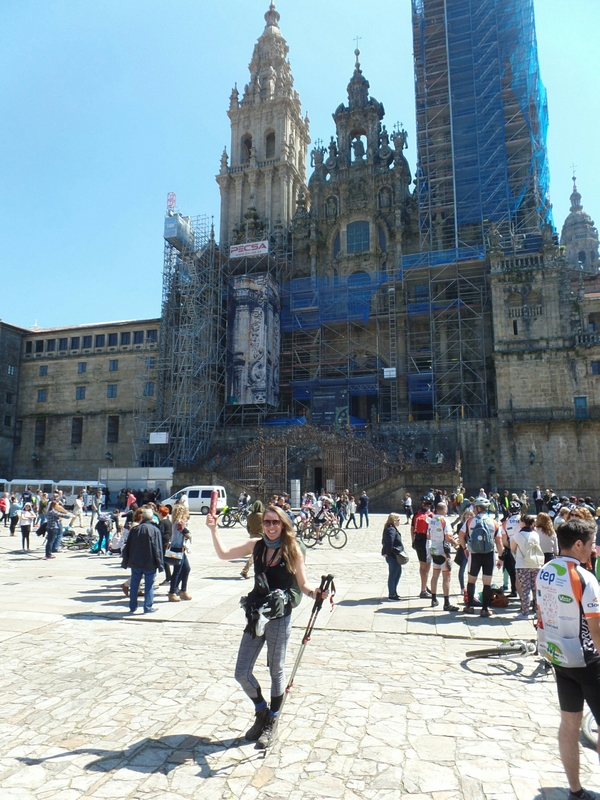 But I do have a lot of looking back to do, and so here is my list of what I’ve learned on the Camino. Thanks to my family, friends and fiancé for supportive messages throughout. When I had tough days, knowing I had the backing of everyone at home kept me going. The Camino is really one huge team. Everyone is trying to achieve the same thing, and everyone wants to help each other make it. Whether it’s providing days or minutes of conversation, blister plasters, or cold and flu medication everyone on the Camino has your back. However much individual hard work goes into walking to Santiago, no one does it alone. Along the way we have been carried along by others, and though I may have entered the square alone, I carried all of my Camino crew with me too. People from all over the world walk the Camino together, but for the most part it is Europeans. When we all pull together, we achieve great things. We are stronger together. Spain rains a lot. GoreTex saved my Camino. I was pretty much warm and dry the whole time. My Dad recommended GoreTex kit to me so many times he had to assure me he wasn’t working for them… his advice was worth its weight in gold. 5. Towels. Turns out I love towels. As great as it is to know I can live a month of my life with just 8 kilos of stuff, checking into a hotel with a bath, towels and no need to check out for a couple of days really does just feel like the most wonderful thing on the planet right now! Thank you. I’m thrilled to be on your list!